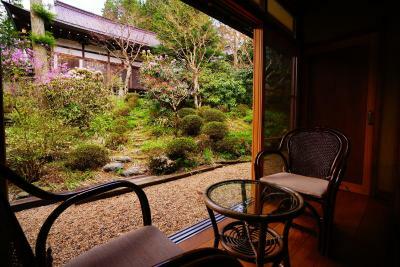 Lock in a great price for Shukubo Koya-san Eko-in Temple – rated 9 by recent guests! Honestly, everything was fine, but for the crazy amount you pay it just wasn't worth it. If anything the price just made me feel a bit cynical about the whole thing, which was a shame as we've had wonderful experiences listening to the monks chanting in the morning (for free) and walking along the sacred Kumano kodo before this. Our first stay in Koyasan, when we didn't stay at a temple, we actually felt more connected with this incredible place. Maybe if you can find a smaller temple it'd be better and more worthwhile, but sharing the experience with so many other people can't help but take away from the intimacy of the ceremonies, even if they are lovely. I greatly enjoyed all of the morning/meditation rituals that were offered to guests. The location was perfect - within walking distance to all the major temples and the cemetery. Nori, one of the monks that guided us through the cemetery, actually helped me mail a postcard that was needed to visit a garden in my next location. He was extremely kind and went out of his way to help. Meals were delightful (tasty, visually interesting and ample). Tatami room beautiful and comfy. Shared facilities clean. Monks were friendly and eager to share. Everything!! Dinner and breakfast are delicious. The location is fantastic. Facilities are beautiful and clean. The morning ceremony and fire ceremony are fantastic. The cemetery tour in the night is so cool too. Great experience of sleeping in a Buddhist temple. Experiencing the morning ritual was one of the most unique things we experienced in Japan! The food was really delicious and very well prepared and presented. Great place to stay! They were all very nice, it was fun to participate in the ceremonies and lifestyle of the monks too. Great traditional food, and the night time cemetery tour was not to be missed.. so informational and cool! And the Ekoin is very close to it! Everything was very straight forward. The monks were very welcoming. I loved the traditional vegetarian breakfast. Koyasan was such a beautiful place to visit in February. It was an amazing experience being in the Monestary with practicing monks. 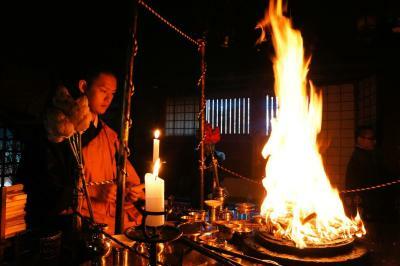 And while cold, the atmosphere really showed the devotion these monks had. It is so fortunate that I could have stayed in here to experience the different activities, it is very solem and educational. I recommend it 100%. The monks (staff as well) are really really really kind and nice people. It is definitely worth your time. 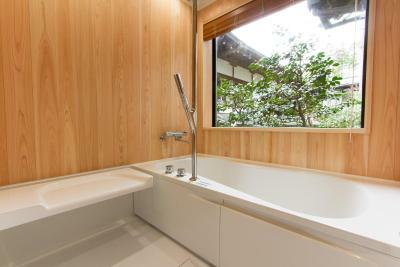 Shukubo Koya-san Eko-in Temple This rating is a reflection of how the property compares to the industry standard when it comes to price, facilities and services available. It's based on a self-evaluation by the property. Use this rating to help choose your stay! A 1000 year-old Buddhist temple, Shukubo Koya-san Eko-in offers Japanese-style accommodations, a beautiful garden and free WiFi. Guests are free to attend Buddhist morning services, the Goma fire ritual and meditation. 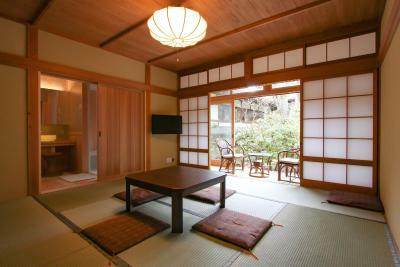 Rooms feature tatami-mat flooring, comfortable futon bedding and paper sliding screens. They are fitted with an LCD TV and a safe. Bathroom facilities are shared, and the public baths are open 16:00-22:00 and 06:00-09:00 daily. Shukubo Temple is close to other ancient Buddhist buildings such as Kongobu-ji Temple, which is a 10-minute walk. 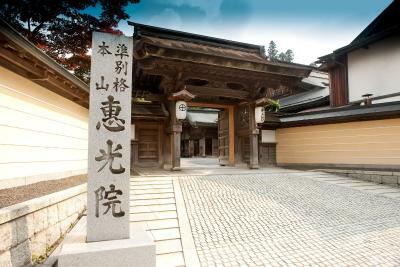 The Ichi-no-Hashi entrance to the ancient Okuno-In Temple is a 3-minute walk away. Guests can experience group meditation, and they can write Buddhist texts with a brush and ink on scrolls at their room. 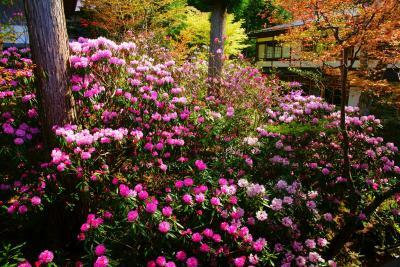 They can also go hiking in the scenic surroundings of Koya-san Eko-in. The temple has a lounge with a PC corner. Meals are served at the guest room at scheduled times and feature Buddhist vegetarian cuisine, and gluten-free meals can be requested at an additional fee. Groups of 4 or more people dine at the Japanese-style dining room, where chairs can be provided upon advance request. 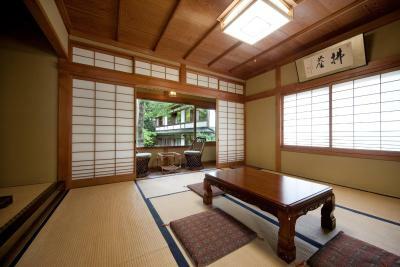 This property also has one of the top-rated locations in Koyasan! Guests are happier about it compared to other properties in the area. 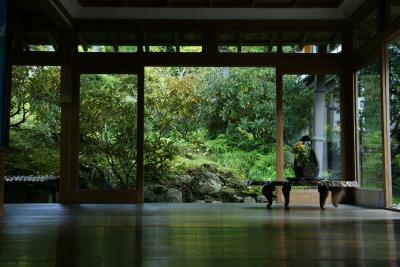 When would you like to stay at Shukubo Koya-san Eko-in Temple? Compact room featuring views of the temple grounds and an LCD TV. 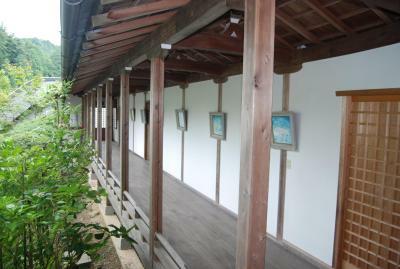 Guests sleep in Japanese futons on the tatami (woven-straw) floor. 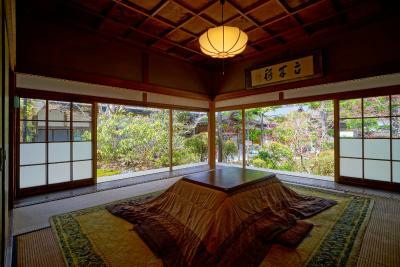 Green tea and yukata robes are also provided. Bathrooms and toilets are shared. This family room features a view and an LCD TV. 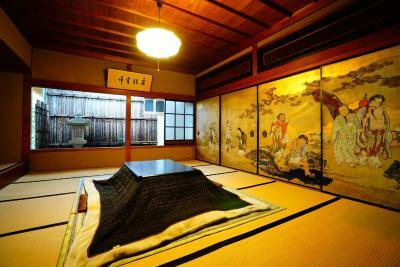 Guests sleep in Japanese futon bedding on a tatami (woven-straw) floor. 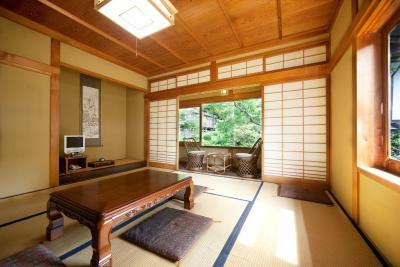 Green tea and yukata robes are also provided. Bathrooms and toilets are shared. House Rules Shukubo Koya-san Eko-in Temple takes special requests – add in the next step! Shukubo Koya-san Eko-in Temple accepts these cards and reserves the right to temporarily hold an amount prior to arrival. 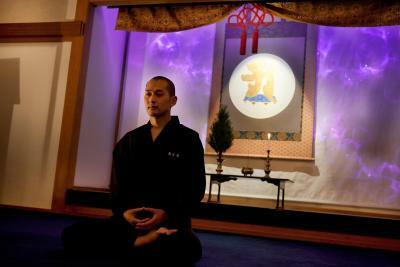 Guests can participate in meditation sessions from 16:30. Sessions can be translated in English when translators are available. English brochures are available for staying guests, as well. Please wear comfortable clothes for the sessions. 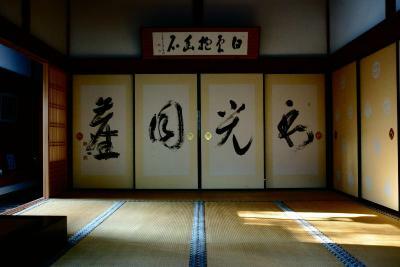 Guests can write Buddhist texts with a brush and ink on scrolls in their rooms for free. Please pick up the tools at the office. Guests can attend the Buddhist morning service at 06:30 and the Goma fire ritual at 07:00. Please note that this schedule changes during the winter. Please note that children will not be provided bedding and meals unless the property is informed prior to your arrival. Extra charges are applied to children's meals and bedding. Please contact the property directly for more details. Breakfast is served at 07:30, and dinner at 17:30. Guests who booked through this website can check-in from 13:00. It is not possible to check in after 22:00. Please note that dinner is not available for late check-in. 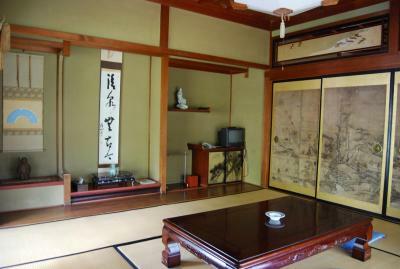 The property recommends guests come to Koyasan and the property with light luggage, due to steep hills and stairs in the area. 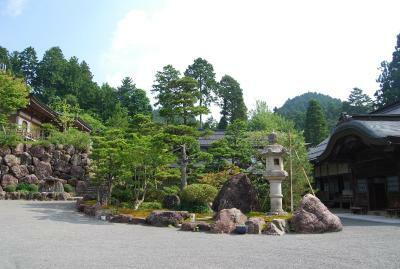 The Koyasan mountainous area is generally a lot cooler than other areas. The property recommends guests bring enough clothes. Public baths are open only from 16:00-22:00 and 06:00-09:00 daily. Guests with food allergies or other dietary restrictions should inform the property in advance. If there are changes in the number of guests, please inform the property by noon on the check-in date to prepare dinner. Please note that the property is pilgrims' lodgings in a temple. It's not a regular hotel, inn or guest house. Could be quite loud at night as people moved about but yet that's expected with the type of building. 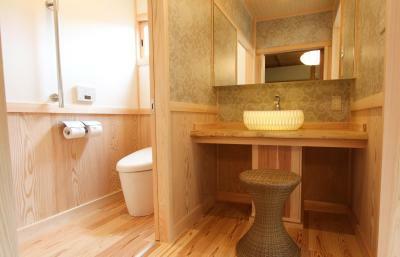 The whole building was very clean and the shared bathroom we used was very modern. Really enjoyed the meditation and fire ritual. Everything was explained clearly so we could understand what was taking place. Nothing... it was all perfect. The temple is a beautifully calm, peaceful and friendly place which was a lovely contrast from the hustle and bustle of Tokyo, Kyoto and Osaka. The room was simple but large and clean and looked out over a little courtyard with a pond. 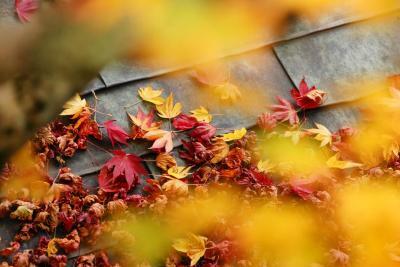 It was great to sit on my windowsill with a cup of tea soaking in the atmosphere. After an afternoon meditation session and a night tour of the cemetery (which is a little extra but well worth it), I had a great night's sleep. There's lot's to see in the town and surrounds and so I wish I had stayed for two nights instead of one and had more of a chance to do some small hikes. I have to also thank the monks at the temple for their warmth, friendliness and good humor. Nori in particular was great to have a chat with. I hope to visit again some day. All the experience was quite touristy and maybe a bit fake? Not a real negative but be aware shukubos by their nature are relatively spare types of accomodations and not all rooms will have amenities like toilets or sinks. 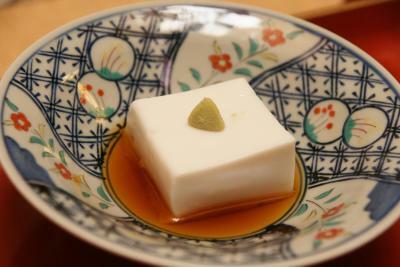 A good choice for a shukubo experience in Koyasan. Relatively close to Okunoin and the meeting point for the cemetery night tour is right at the front entrance. You can attend the morning prayer and fire ceremonies as well as day time meditation classes. Young monk novices were helpful and seemed eager to impress. Vegetarian fare on offer was quite good. Nice place to stay, however it is very much overpriced. Everything was wonderful. Expensive but worth it for one night. Beautiful space and the monks were all lovely. Food was delicious and beautifully presented, and the room was very comfortable. The morning ceremony was very special and I feel lucky to have seen it. Great experience! The room was very clean, everyone was very kind and speak good english. We stayed there for one night and had a great time. The night tour in the cemetery is a must! There is also meditation class available. Getting involved with all the extras that this place has to offer is the key to getting the most out of this beautiful temple stay. We did the meditation, the fire ceremonies and the nighttime tour, all of which we highly recommend doing as well. It was brilliant to be a part of it. The food is amazing, served in your room and so tasty, we really enjoyed that too. Our room faced onto a little inner courtyard which was gorgeous as well. The meals were vegetarian and as both my husband and I eat meat and fish we thought the meals might be boring - but no - they were delicious!! At the fire ritual at the morning there was way too much smoke that left us with tears in our eyes and smelling like an ashtray for the rest of the day. The room is not like the photos, the views are horrible, the toom is small and simple. The food is horrible, and the ceremony is not so good as you can imagine. Obviously 59000Y for one night is too much for this horrible place. 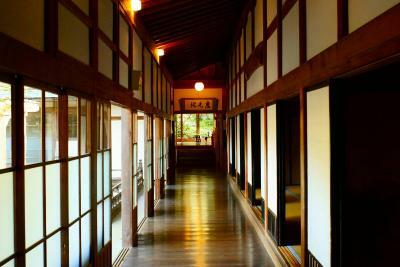 We expected to feel a special athmosphere, staying in a temple - it was like any other ryokan. The food was served in our room so we didn't meet other visitors. 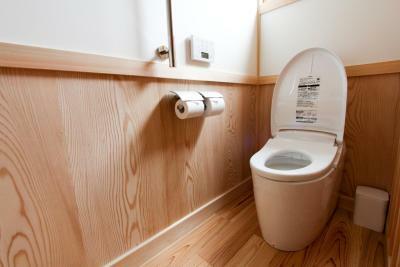 The room was great, the attaced bathroom was modern and comfortable. 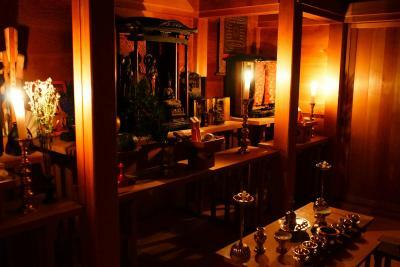 The price for this kind of room in a temple was very high (the highest we paid in Japan). The staff was helpfull. We enjoyed the morning rituals, a special experience. Taking bus from Koyasan Station, the Eko-in is close to the 苅萱堂前 Karukayadou bus stop. The fine vegetarian dinner and breakfast are included in the accommodation package. The morning service is the Must to participate. It was a pleasant stay in the temple. It was really cold outside the rooms - I decided to skip the baths because couldn't brave the cold outside the room.